I’ll honest with you: I don’t really feel like writing today. 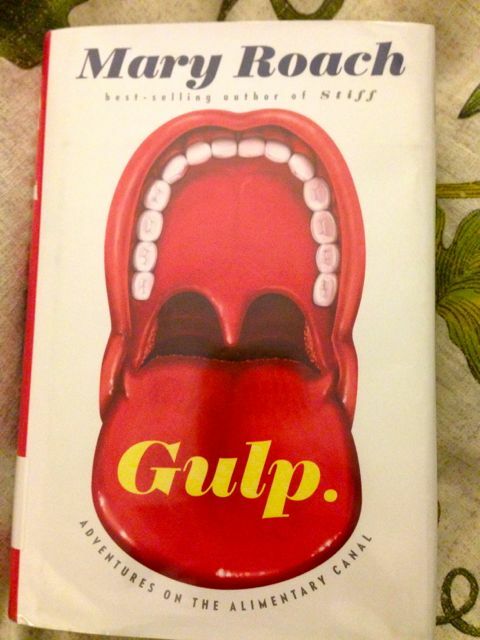 First, I finally picked up Mary Roach’s latest book, Gulp, at the library yesterday, and I could easily spend the rest of the night in bed reading. I was convinced that I needed a fiction book to get me back into reading, but I forgot what a fantastic writer Mary Roach is. I also might be coming down with something. Pat mentioned this morning that he felt a cold coming on. Rory’s been coughing at night. Noah makes frequent reference to a cold that he “just had” or “may still kind of have, maybe,” though I’ve yet to see symptoms. I, who pride myself on rarely getting sick but live in constant fear of being struck with a horrible illness for even thinking such hubristic thoughts, felt healthy as a horse. A headache started creeping up in the afternoon as I was preparing the boys’ afternoon snack, and I found myself frequently closing my eyes and pressing my forehead against edge of the kitchen cabinets. I just assumed the headache was stress related. I was trying hard to reflect on the “patience” mantra I trotted out in yoga yesterday. I was not doing a very good job. “Waaaah!! !” [email protected]#k it. Where are the Thin Mints? 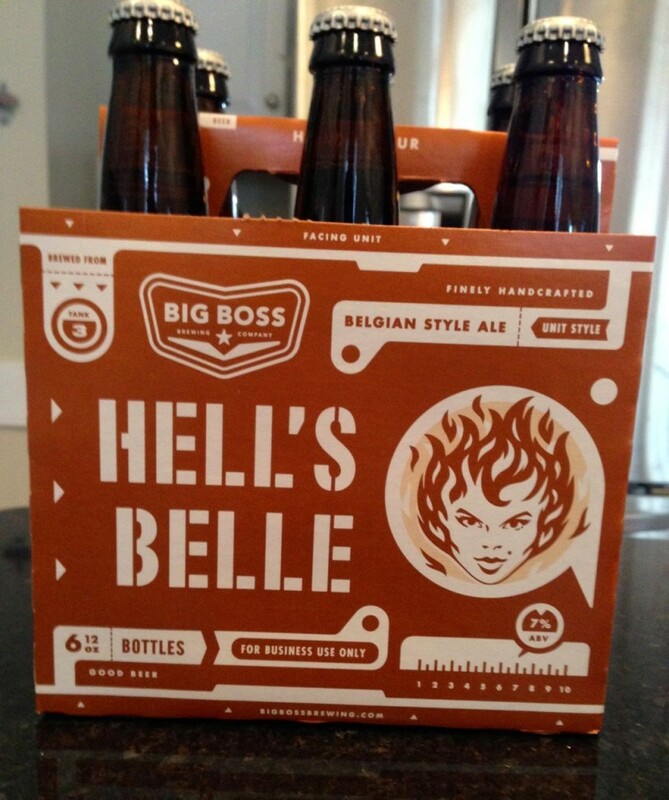 The #1 item on my “snowpocalypse” grocery list. I’m fairly certain that this photo captured every snowflake that fell in Durham last Tuesday. It appears that some is actually sticking to the ground tonight, guaranteeing the dreaded school closing. Anyway, a good book and illness – real or imagined – notwithstanding, I didn’t want to drop the ball on a Souper Tuesday recipe. This week: homemade tomato sauce. This might seem out of left field, considering it’s hardly the height of tomato season. But this recipe is surprisingly appropriate for any time of the year, and better, it’s really easy. On Monday, my friend Alice offered me some surplus Roma tomatoes, along with some wasabi mashed potatoes (the potatoes don’t factor into this recipe, but do stand as a reminder that I will gratefully – gleefully, really – accept food offerings of every variety). I assumed I would use these gift tomatoes in a kitchen sink salad or broil them on a tuna melt. But suddenly it was 4:00 and my “what’s for dinner?” panic started creeping in. I had the ingredients for my super easy, universally-accepted standby: spaghetti and meatballs. I had everything I needed: the frozen veggie meatballs (the Dominex eggplant ones are our favorite), a box of noodles and a jar of Newman’s Own Roasted Garlic Marinara. But then I saw the tomatoes. I turned to my guru Mark Bittman’s cookbook “How to Cook Everything: The Basics” (the same place I got this granola recipe). Bittman is pretty much a “real food” kind of guy, so I was surprised (and secretly pleased) that his recipe calls for canned tomatoes. He includes a variation for fresh tomatoes, but he doesn’t lead with it. I only had about half the amount of fresh tomatoes that recipe would call for, so I used three Romas and one 14.5 oz can of diced. I also used a variation Bittman offered for “Spicy Tomato Sauce,” which you may know as “arrabbiata.” (I’m using that version here). 1. Cook the pasta, reserving 1 cup of cooking water. 2. Put the oil in a large skillet over medium-high heat. When it’s hot, add the garlic. Cook, stirring, until the garlic is brown – deeply colored, but not burned. Then turn off the heat for a minute, add the tomatoes. 3. Adjust the heat so the sauce bubbles enthusiastically and cook, stirring occasionally, until the tomatoes break down and the mixture begins to thicken and appear more uniform in texture, 10 to 15 minutes. 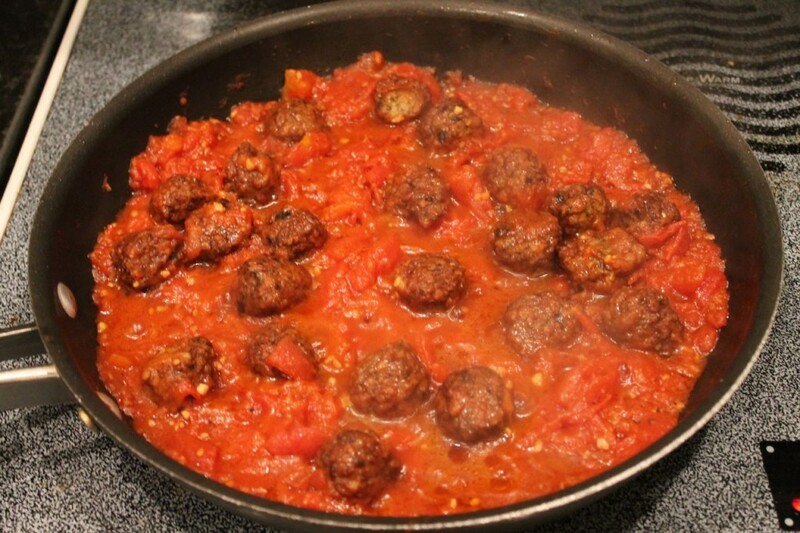 (Add meatballs here, too, if you’re including them.) Taste, adjust the seasoning, and adjust the heat so the sauce stays hot but doesn’t boil. 3. Add the pasta and a splash of cooking water to the sauce in the skillet and coat, adding a little more oil (I did) or cooking water if necessary to create a slightly creamy sauce. Taste and adjust the seasoning and add more if you’d like; then toss with the cheese and the basil if you’re using it (I didn’t). Serves 4. I was excited to try this recipe; I had the ingredients, it looked fast and easy. My excitement waned as Pat walked into the kitchen. I think I actually saw the words “tomato alert!” flash in his eyes as he glanced at the pan. “Whatcha makin’?” he said in the same pseudo-casual cheerful voice he uses to compliment an obviously bad haircut. At this point, Noah walked up to the stove. “Oh no, toomaaatoeees!” he whined. I glared at Pat. Pat still looked suspicious as I spooned the finished sauce into the bowl. I applied a heavy dusting of Parmesan cheese to each bowl to disguise the obvious chunks of tomatoes mixed in with the noodles. “I’m going to need you to be a leader on this,” I said to Pat, raising my eyebrows and holding his gaze as I walked from the stove to the table. And then…everyone liked it. Really, they did! And as a bonus, because the sauce was less, well, saucy, Rory’s face, clothes and hair weren’t coated in it by the end of the meal. 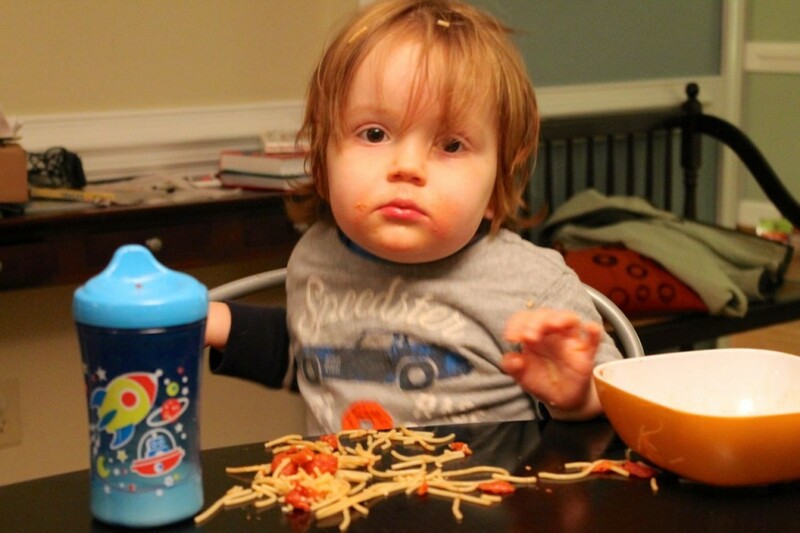 Sure, there was still a rug of noodles under his chair. But that’s just another day in motherhood. 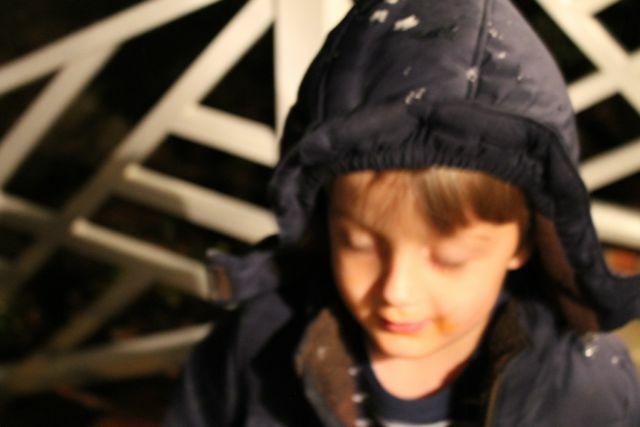 Yes, Rory dumped the spaghetti all over the table, but it’s because he wanted to wear the bowl as a hat, not because he didn’t like the recipe. So, this was a revelation to me, but tell me: do you make your own tomato sauce? Is using tomatoes from a can heresy? Is EATING tomatoes heresy? But Becca, what am I going to do when the Girl Scout cookies run out?? ?